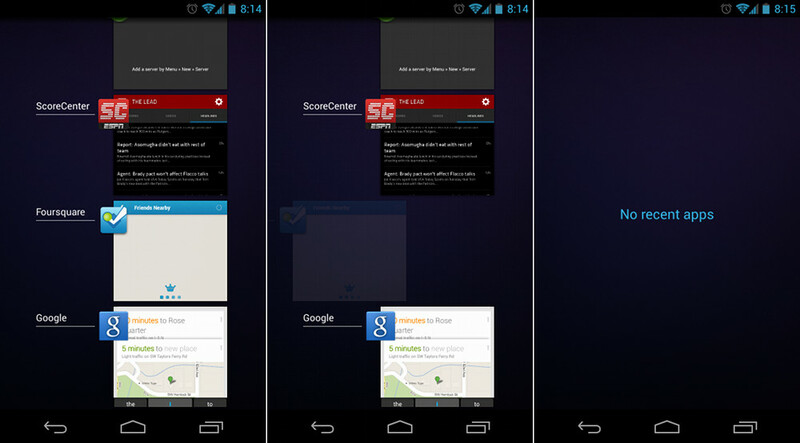 When the Android team first unveiled Ice Cream Sandwich (Android 4.0), one of the flagship features shown off was a new way to quickly switch between recently used apps or remove those same apps from running. On stock Android devices, or devices that use on-screen navigation keys, the button to access this new app switcher menu looks like two rectangles on top of each other (see image above). On devices like the Galaxy S3 which utilize a physical home button, a simple long press on that button will bring up the same menu. In previous versions of Android, a long press on Home popped up a simple app switcher, however, it lacked much functionality or design flair. In the newest versions (Android 4.0+), you can see thumbnails of your recently used apps that show you a preview of where you last left off. A simple tap on the thumbnail then jumps you into the app, again, exactly where you last left it. On the flip side, you can kill off apps just as easily as you would switch to them, thanks to a new swiping gesture. If you would no longer like to see an app appear in your recently used app list, touch your finger to it and swipe it off the screen to either the left or right. Not only does this remove the app from showing up in your list, it also kills the app from continuing to run in a position that you last left it. Should you need to open a killed app again, you’ll notice that it opens from a fresh spot. 1. From any screen tap the app switcher button (the double rectangles). 2. A list of your recently used apps should appear. 3. To remove one, touch and hold on the app while swiping it off the screen. 5. You can also long-press and enter “App info” to uninstall an app or stop it completely. 6. If you continue to swipe apps away until they are gone, you’ll be left with the screen on the left. On most Samsung devices, a long-press of the physical home button will bring you the same recently used apps menu. Swiping them off the screen will also kill them off, but you will likely see a trash can button in the bottom right corner as well. Should you press that, all of your recently apps will be removed. On most HTC devices released in the last year, there is an app switcher button, however, the recently used app list looks much different. The apps tend to show up as 3D cards that can are viewed through a horizontal menu. If you would like to remove a single app from appearing, a swipe up on the card will do the trick. 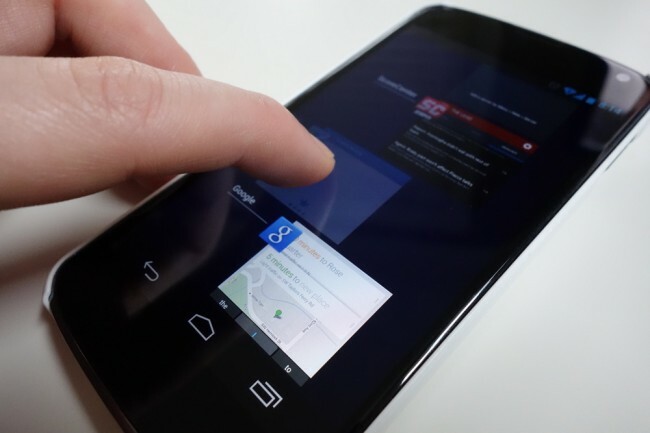 Most Motorola devices released in the last year have the standard Android task switcher button.